Manolo says, over the next few days, the Manolo will be giving his forecast for the coming years shoe trends. This next trend, which has been developing over the past year, has now fully arrived, and it is the brightly colored shoes. Currently we are seeing shoes which are saturated with color, not the primary color, but rich variations in the purples, the oranges, the yellows, the greens, the blues, and the reds. This trend to color is visible at all levels of the market. 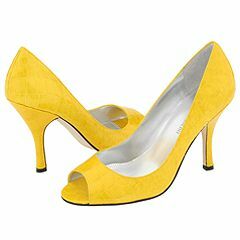 Look, here are affordable shoes from Enzo Angliolini in bright orange and yellow. And in the more expensive prices, here is deep purple satin slide from Ralph Lauren. Yellow-ish platform shoes from Bruno Frisoni. Two varieties of red from the Christian Louboutin. So, add some colors to your feets this year. P.S. Shoe Trends for 2008, Part One. This entry was posted on Monday, January 7th, 2008 at 2:12 pm by Manolo the Shoeblogger and is filed under Christian Louboutin, Pumps/Court Shoes, Shoes, Trends. You can follow any responses to this entry through the RSS 2.0 feed. Both comments and pings are currently closed. So happy that color is coming back. Personally, I consider red a neutral, like black and grey. Nice to see some color after so many years of black on black with black accents. I’m currently rockin’ a pair of red snakeskin Manolos. I love the orange Angiolini’s you’ve got up there. This is just awful. I hate pointy toes. I have wide feet and the arrival of round-toed shoes was a boon. Finally I didn’t have to make a choice between shoes that pinched my toes but fitted the rest of my foot and buying them in a non-pinchy bigger size which of course might mean, depending on the cut, that they were possibly a touch too long for my foot. Of course if you got it wrong and they *were* too long in the foot, disaster ensued. Cinderella in a fairy-tale, oh how sweet. In practice leaving your shoe behind as you’re bustling along the pavement is a recipe for acute embarrassment. The worst was the day when my shoe fell off my foot onto the train track just as I was getting on to the commuter train. They had to stop the entire train and send the guard off to get the special “pick that silly woman’s shoe off the track” stick so that he could retrieve my shoe and return it to me before several hundred people could go to work. I hid my face in my newspaper for the rest of the journey. And now they’re back. Curses. And colour? Colour is fine in moderation. The last two shoes are lovely although really it’s the shape of them that attracts me, but the rest are so bright. How could I wear those? I’m not a children’s TV presenter. In fact, not even they could wear shoes 1 through 4 since their shoes are typically shaped like mismatched cornish pasties. I’m going to stick with the beautiful Beatrix Ong black patent peeptoe 3.5 inch heels that I bought just before Christmas which are perfect for the winter wedding that I will shortly be attending. Comfortable (no, really), beautifully shaped and a lip-smacking 70% off, thanks to the special one-day-only-and-never-to-be-repeated-40%-additional-discount to which I was alerted by The Thoughtful Dresser. All hail Ms Grant. I’m for it. I never stopped wearing gorgeous colored shoes. I have art-leather shoes that are 30 years old, perfectly cared-for and capable of small miracles in lifting boring clothes to heights they don’t deserve. While the go-to pair are smart black pumps for the grocery or the doctor, any time I care I pick a splashy pair. Once when I was undergoing a period of poor health and was still working in design, it was my shoes and my earrings that got me through. Give enough thought to those two things and no one knows you look bad. I feel sorry for anyone of any age whose shoes are not as nice as Barbie’s. Why do I HATE mules (“slides”) so much? And I hate the slapping noise they make while one walks. I think this stems from a traumatic gold metallic mule incident from the early 90’s. La BellaDonna says Hola to the MQ, CB, and hopes she is feeling better. La BellaDonna sympathizes, because she understands – La BellaDonna loves the round toe shoes, and cannot wear them, because the feet of La BellaDonna are pointy! No, they are not mutilated from years of the tempermental shoes – they are the little joke of Nature. So if La BellaDonna wants the round-toed shoes, she must buy them too large and clompy. For the brightly coloured shoe, though, the outfit in the neutral colour (La BellaDonna hesitates to say “black,” but often it is so) is the perfect background for the candy-coloured shoe. For the brightly coloured shoe, though, the outfit in the neutral colour (La BellaDonna hesitates to say “black,” but often it is so) is the perfect background.